Mangroves are salt-tolerant vegetation that grows in intertidal regions of rivers and estuaries. They are referred to as ‘tidal forests’ and belong to the category of ‘tropical wetland rainforest ecosystem’. Mangrove forests occupy around 2,00,000 square kilometres across the globe in tropical regions of 30 countries. 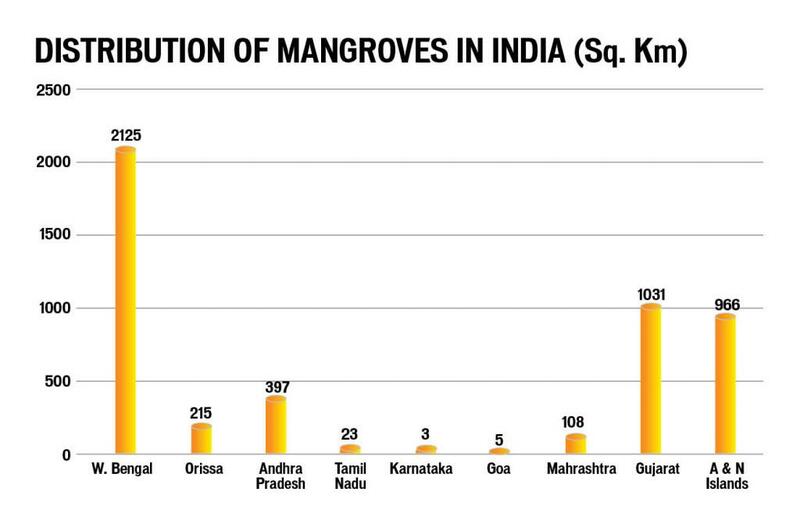 India has a total mangrove cover of 4,482 sq km. A mangrove ecosystem is the interface between terrestrial forests and aquatic marine ecosystems. The ecosystem includes diversified habitats like mangrove-dominant forests, litter-laden forest floors, mudflats, coral reefs and contiguous water courses such as river estuaries, bays, inter-tidal waters, channels and backwaters. Mangroves are trees and shrub species that grow at the interface between land and sea in tropical and subtropical regions of the world, where the plants exist in conditions of salinity, tidal water flow and muddy soil. The structural complexities of mangrove vegetation create unique environments which provide ecological niches for a wide variety of organisms. Mangroves serve as breeding, feeding and nursery grounds for most of the commercial fishes and crustaceans on which thousands of people depend for their livelihood. Mangroves give protection to the coastline and minimise disasters due to cyclones and tsunami. Recent studies have shown that mangroves store more carbon dioxide than most other forests. Mangroves are an intermediate vegetation between land and sea that grow in oxygen deficient waterlogged soils which have Hydrogen Sulfide (H2S). They perform important ecological functions like nutrient cycling, hydrological regime, coastal protection, fish-fauna production, etc. Mangroves act as shock absorbers. They reduce high tides and waves and help prevent soil erosion. They also provide livelihood opportunities to coastal communities. Sundarbans in the Gangetic delta with an area of 2.12 lakh hectares (ha) supports 26 plant species of mangrove with a maximum height of more than 10 metres. Pichavaram in Tamil Nadu with an area of 1,100 ha supports 12 plant species growing to a height of 5 metres. Muthupet is the biggest mangrove forest in Tamil Nadu with an extent of 11,885.91 ha with poor species diversity due to lack of fresh water supply. But mangroves are being destroyed and facing severe threats due to urbanisation, industrialisation, and discharge of domestic sewage, industrial effluents and pesticides. Saltpans and aquaculture also pose major threat to the mangroves. As a result, mangroves get depleted to the tune of 2-8 per cent annually at global level; 40 per cent of mangrove forests in West Coast of India have been converted into farmlands and housing colonies over the last three decades. Some of the mangrove species like Bruguiera cylindrica and Sonneratia acida are at the verge of extinction. Due to shrimp farming, about 35,000 ha of mangroves have been lost in India. Though we have the Environmental (Protection) Act, the Supreme Court’s order banning semi-intensive and intensive aquaculture in the coastal areas, and the Coastal Regulation Zone (CRZ) notification with strict enforcement of the legislative measures, scientific management practices are very much essential for conservation and sustainable management of the precious mangrove forests. Suitable sites are to be identified for planting mangrove species. Mangrove nursery banks should be developed for propagation purposes. The economic and ecological values of the species are yet to be identified. Environmental monitoring in the existing mangrove areas should be taken up systematically and periodically. Various threats to the mangrove resources and their root causes should be identified, and earnest measures should be taken to eliminate those causes. The participation of the local community should be made compulsory for conservation and management. Floristic survey of mangroves along the coast is to be taken up to prepare biodiversity atlas for mangroves. Potential areas are to be identified for implementing the management action plan for mangroves, especially in cyclone prone areas. Socioeconomic studies on the mangrove-dependent people need to be taken up to involve them in management of mangrove biodiversity. Coastal industries and private owners need to be persuaded to actively participate in protecting and developing mangrove biodiversity. The forest department officials should be trained on taxonomy, biology and ecology of mangrove species. Agro-forestry along the periphery of mangroves in the wastelands can be taken up for providing alternate fodder to the cattle of nearby villages. Alternative livelihood and income generation options like dairy farming, bee keeping, palm candy production, coconut leaf thatching, dry fish marketing, small provisional shops, vegetable shops, etc, can be taken up by the mangrove-dependent communities. So far, none of the mangrove species has been included in the Red List of the International Union for Conservation of Nature (IUCN). A scientific study reported that 100 per cent of mangrove species, 92 per cent of mangrove associates, 60.8 per cent of algae, 23.8 per cent of invertebrates and 21.1 per cent of fish are under threat. Periodical monitoring of the mangrove forest is very much necessary to assess the status. The impact of environmental and human interference on marine flora and fauna needs to be assessed. The traditional rights of coastal communities to use the natural resources in their surrounding natural habitats for their livelihood should be recognised while formulating and implementing regulations and conservation measures on priority basis. Therefore, while mangrove forests play a major role with more valuable ecological services, scientific management of the same is the need of the hour not only for the wellbeing of the mankind but also for coastal biodiversity.